I've been lately obsessed with this soap bar from Alanna. Never tried anything from this brand before and I'm so glad that I did try and absolutely find it so effective and useful for my skin. I'm crazy about anything charcoal so it was like a cherry on the top because it also contains green tea in it. This soap bar is best suited for both Men and Women, trust me because more than me my husband uses it. It is good even for sensitive and dry skin although you need to apply a little bit of moisturizer after washing your face if you do have really dry or dehydrated skin. but otherwise, it's a good soap for all skin types. I also adore the fact that it can be used for the body as well as the face. That way it saves up a lot of money and also one bar goes a long way until handled with care like let it dry after the use and keep it in a clean and dry area in the bathroom. It's an Anti-Acne and Anti-Tan soap, It contains Aqua, Olive Oil, Coconut Oil, Palm Oil, Sesame Oil, Cocoa Butter, Cocoa Powder, Lye. 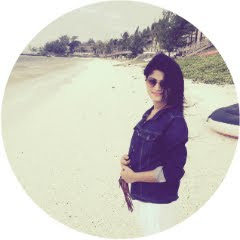 In addition to it, The fragrance is to die for, it's refreshing and citric. 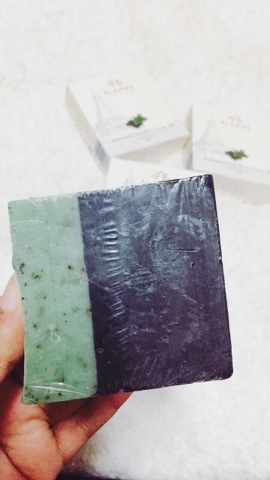 What Alanna Activated Charcoal & Green Tea Soap does to your skin? It extracts excessive oil and dirt, due to charcoal. As activated charcoal draws bacteria, poisons, chemicals, dirt and other micro-particles to the surface of the skin, helping you to achieve a flawless complexion and fight acne. Furthermore, It brightens up the skin as Green tea has anti-aging and antioxidant benefits that can help delay signs of skin aging, such as sagging skin, sun damage, age spots, fine lines, and wrinkles. The polyphenols in green tea help neutralize harmful free radicals, which can cause significant damage to the skin and accelerate the aging process. Too many benefits in one bar. 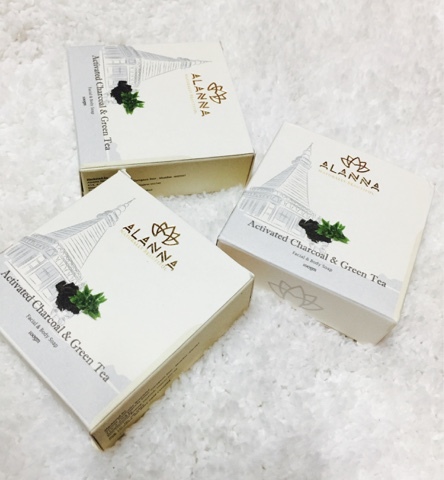 How to use Alanna Activated Charcoal & Green Tea Soap? It is extremely simple to use the soap, wet skin with water, gently apply the soap using a loofah or by itself and rinse it off. Why do you need to buy Alanna Activated Charcoal & Green Tea Soap? Firstly it's super affordable, retails for 175 INR for 100 gms but if you buy it from Amazon.in you get it for 150 INR which is absolutely cheap if compared with a separate face wash and shower gel. Furthermore, it's super beneficial for the skin. I would highly recommend this facial and body soap by Alanna, This is truly a holy grail product. Thank you for stopping by, Keep visiting.